Ask fellow campers about "Area's Finest Country View Campground" and nearby attractions. We stayed in this campground for an overnight stay on our way into Utah. We were guided into our camping spot, a very long pull-through. We only used the 30 amp electricity and it worked fine. Gravel pads and roads but in good shape, even with it being a very rainy stretch of weather. OK spacing between sites. We camped at Area's Finest Country View Campground in a Fifth Wheel. We used this park as an overnight stop to and from South Dakota. The sites are long and narrow. You are guided to your site. The owners are friendly and very helpful. The laundry is clean and reasonably priced. We would definitely stay here again and may use it for a layover too. We camped at Area's Finest Country View Campground in a Travel Trailer. Shopping and restaurants close by. Margaritas Mexican food is good. We liked it so much the first time we ate there again on our second stay. 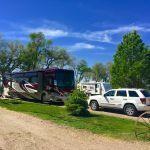 We chose this campground for a several night stay so we could experience Western Nebraska scenery and history and to unwind after several weeks on the road. It's a sweet campground, well maintained, and well used for one-night stays. We were guided to our level, long, narrow, gravel pull-through which included well-placed water. electric, and sewer hookups and cable tv (which was accessed by the supplied remote). Verizon and ATT worked well and WiFi was semi functional. There was a nice, well-maintained pool and gravel internal roads were good. Easy access to grocery store and gas. This is not a destination park, but was fine for what we wanted. We would stay there again if in the area. We camped at Area's Finest Country View Campground in a Fifth Wheel. Level gravel pull through with good FHU. We camped at Area's Finest Country View Campground in a Fifth Wheel. This was our 3rd stay at this delightful campground. Nice long pull throughs, a beautiful pool, WiFi, cable and owners that make you feel like one of their family. We camped at Area's Finest Country View Campground in a Fifth Wheel. Valentino's delivers to the campground. If we hadn't had chicken the night before, we would have followed Cindy's suggestion of broasted chicken. However, we ordered pizza and were very happy with our choices. Beautiful campground with long level sites that are easy to get into. Hosts were very friendly. Laundry was reasonable. Everything had a very clean look. We camped at Area's Finest Country View Campground in a Travel Trailer. We stayed here 3 nights and really enjoyed it! Very nicely kept up park. It was easy off I-80 but very little noise. The sites are very long and mostly level, all utilities worked well, WIFI was great, AT&T and Verizon had good signals. They offer cable as there are no OTA, but we didn't use it. We didn't use the laundry but peeked in and it was clean. The campground looked full almost every night and then would be almost empty in the morning, so a lot of over-nighters. There is really a lot to see in this little town. This was really a great park with lots of sites. We camped at Area's Finest Country View Campground in a Fifth Wheel. The Petrified Museum is a must see. Good place to overnight while traveling through the area. Pull through sites are very long. Room for any size rig or if you have RVs and boats/jet skis for the nearby Lake Mac. We saw a few set-ups like that. Lots of grass and good place to walk the dogs. Didn't use the restrooms. We would stay again if traveling through. We camped at Area's Finest Country View Campground in a Motorhome. Site #18: 30 amp pull-through $37.02 with GS discount. This is a lovely little RV park that is very well maintained. All sites are gravel, full service, and pull-throughs with a picnic table (that you are not allowed to BBQ on) and grassy area (that you also are not allowed to BBQ on) and no fire pit. There is a pool with a few chairs but no shaded area, a laundry, and showers, though we did not use the latter. The campground is far enough away from I-80, that there is little road noise. WiFi is decent. We camped at Area's Finest Country View Campground in a Fifth Wheel. There is a Safeway and a small WalMart Supercentre in Ogallala. The WalMart has limited parking for larger RV's and maneuvering can be tricky. 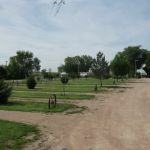 When we arrived at Area's Finest Country View RV Park, Ogallala, Nebraska - there was a mix-up with our reservation and the park did not have another vacancy. Needless to say after driving for 7 hours and being tired and hungry we were getting nervous. The hosts were very willing to help and called the owner to find a solution to our problem. The owner arrived within 5 minutes and corrected a empty site that had a breaker problem. We have such praise for this park, the hosts and owner. Site was level, under a nice shade tree, in front of the really nice and clean shower house. Clean laundry, good wifi service. We highly recommend this Park and awesome staff. We camped at Area's Finest Country View Campground in a Motorhome. Excellent wifi. Somewhere around 150-200 cable channels. Level sites. Only negative was pea-gravel sites but not a big deal. We camped at Area's Finest Country View Campground in a Fifth Wheel. A plus was a Dairy Queen within walking distance (1/3 mile). HA HA. This is one of the nicest campground we've ever visited. Less than a mile off I-80, it is a treed virtual oasis amidst an otherwise relatively treeless landscape. And, despite its proximity to I-80, it is very quite. The park is immaculate. The owner is terrific and gave us a complete overview of the area when we checked-in. Moreover, Ogalla also offers a day or two of interesting sightseeing (Petrified Wood & Art Gallery, Mansion on the Hill, Lake McConaughy, Kingsley Earthen Dam and even Boot Hill!). Clearly in the top five of the more than 300 campgrounds we've stayed in across he US and Canada. We camped at Area's Finest Country View Campground in a Motorhome. Very nice campground. Not much of a "country view" being very close to town. But site was good, electric and water excellent. Hosts helpful. Laundry room clean and reasonable. Small pool, not really heated. Stayed one night. We camped at Area's Finest Country View Campground in a Travel Trailer. Owner was very helpful. Had trouble hooking to their strange cable tv system but he came immediately and found the issue. Very good Wi-Fi. Far enough off of interstate to not hear the traffic noise. Clean, well kept park. We camped at Area's Finest Country View Campground in a Motorhome. Rate included a 10% Good Sam discount for a long, level, pull-thru, dirt, FHU site with 50 amp electric. Site was a bit narrow, but did have a grass area between the adjacent sites. We had good Verizon cell and internet reception and good DishTV reception. Park had easy access from I-80 and Walmart is nearby. The park was quiet at night and had no disturbing highway or train noise. We would stay again. We camped at Area's Finest Country View Campground in a Motorhome. You're not hallucinating.. the water tower in town is lit up like a flying saucer at night. Valentine's pizza was to die for....delivery right to your site. Best part of all...the local Valentino's pizza place delivers to the campground. It was the best Val's pizza we've had in a long time. Ogallala has Nebraska's largest lake which is a reservoir. The dam produces much of Nebraska's electricity and is gorgeous with fine white sand beaches. Boot Hill is an old pioneer cemetery from Ogallala's wilder days. Also the petrified wood museum is not to be missed! We toured "The Mansion on the Hill" built in 1887 and still mostly original. Ogallala claims to be Nebraska's Cowboy Capital. Order a Valentino's Pizza, they deliver! Ogallala has many amenities: WalMart, Safeway, ShopKo, fast food, family dining, and all fuels available. Off season meant fee perks. However bathroom facilities were no available due to remodeling, disappointing but understandable. The town of Ogallala does have some nice dining establishments, many fast food options, gas stations, and a WalMart and Safeway. Quite a few nice restaurants in town and shopping is very convenient. There are restaurants in close driving distance. A Walmart about a half mile away. If you enjoy water recreation, Lake McConaughy is a few miles away (and they have camping there). The Petrified Wood and Art Gallery was interesting. Front Street for tourist stuff. Lake McConaughy, go down by the outlet if they are letting water out it is impressive. Boot Hill Cemetary was a nice historical stop. The Mansion on the Hill looked good also. Had dinner at The Spur. Food and service were good. Steak done just right. Tour the sand hills area north of Ogallala. Very close to Walmart. Ate at the Front Street Restaurant. Food and service was good. Had a good show put on by local high school and college kids. Had a good time. The nearby Wallmart and Conoco have reasonably priced diesel. The owner keeps his own chickens so has fresh eggs available. Shopping is nearby with both a WalMart and Shopko at the I-80 off ramp. A Safeway grocery store is located in the town of Ogallala. Try the Front Street Steakhouse in town. Walmart and restaurants close by if supplies are needed. 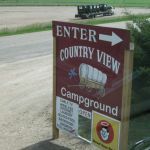 Are you affiliated with Area's Finest Country View Campground ?